Eagle Rock Studios Atlanta was carefully designed to be flexible, comfortable, and time-saving for each production. One of the many unique features that Eagle Rock Studios Atlanta provides are the 3 breezeways located throughout the facility. The breezeways enable the ease of flow between stages, basecamp, shops, storage, and offices. The most noteworthy breezeway is the commodious Main Breezeway which is conveniently located in the middle of the studio, separating Stage 1 & 2 from Stage 3 & 4. Productions found the Main Breezeway to be appealing because it gives them the option to have a covered, on-premise basecamp area. A covered basecamp has become the new luxury for cast members who are used to walking from their private trailers to makeup, wardrobe and the set with the possibility of getting rained on or sweating in the Georgia heat. This is beneficial, not only because of the unpredictable Georgia weather, but also the amount of time that is saved. The phrase, “time is money” is no exception to the film industry. With basecamp located literally steps away from set, the Main Breezeway eliminates the process of shuttling cast and crew back and forth. 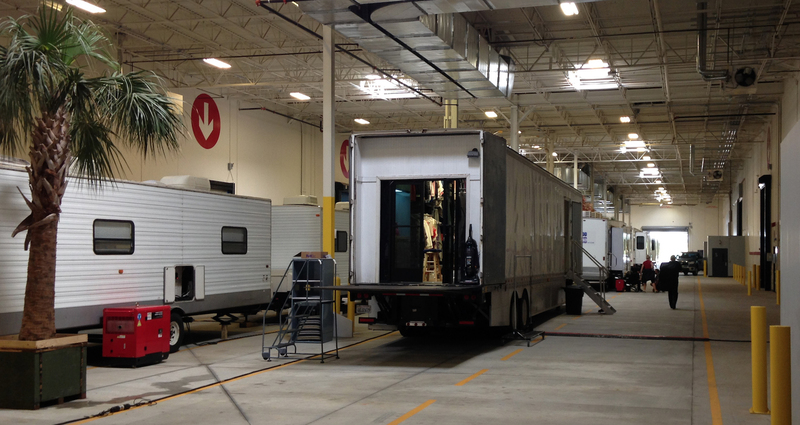 With the ability to drive production and cast trailers straight into the building, it’s no wonder why the Main Breezeway has become the studio’s main attraction.